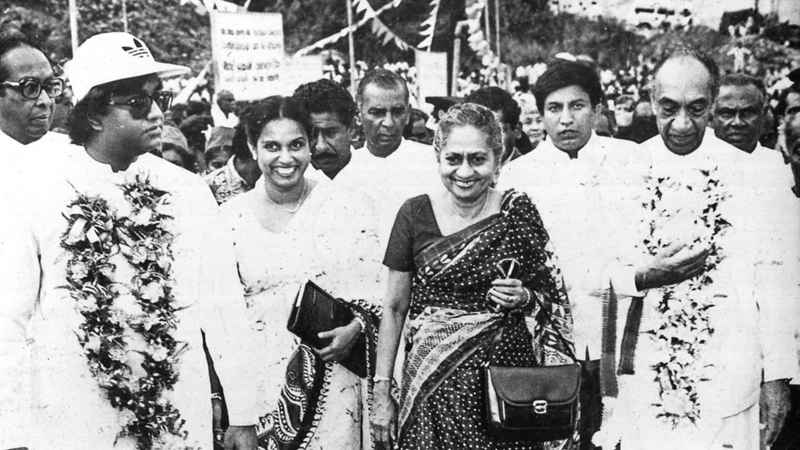 Gamini Dissanayake and Srima Dissanayake with former President J. R. Jayewardene and First Lady Elina Jayewardene. The recent death of Srima Dissanayake made many reflect the era where Gamini Dissanayake played a radical liberal role; though he was not made to do so. It is absurd that Gemini’s cruel death came at a time when he, more than any other liberal Lankan leader, had been responsible for the restoration of Tamil as an Official Language on par with the Sinhala Language. Then we were jointly working for the implementation of the 13th Amendment. He became friendly with me while struggling to make this possible. The 13th Amendment to the Constitution, a timely and important attempt did not get the attention. It is a tragedy that it is not implemented completely. Full implementation could lead to a successful solution to the Tamil national problem. It is said that Gamini was able to convince President J. R. Jayewardene and the Cabinet to recognize Tamil as an official language, enjoying parity of status with the Sinhala language, thereby responding to a basic grievance of the Tamil nationality. However, this did not save him from the terror of Tamil nationalism. Gamini was a liberal that believed in rationality and modernism. He was glad when he got an opening to Cambridge, for higher studies in modern philosophy. For a Lankan lawyer that was a great step forward. He was a lawyer that believed scientific knowledge is essential. Contrary to expectations, the last century automation did not produce poverty with unemployment; instead, there was wage and employment growth. Some academics said that Marxist prediction went wrong. However, Marx predicted growth of science will introduce new technologies to expand production, because of the power of the proletariat. That exactly happened. The growth of democracy and technology was accompanied by new systems geared towards maintaining the role of human labour in value creation. Bourgeoisie avoided revolution by new arrangements with the modern proletariat. Under global capitalism man has entered the era of artificial intelligence; it will be up to political leaders and policymakers to ensure that the man will live in modern facilities while working to continue the whole technological system. Artificial intelligence is transforming every aspect of human lives, not least the economy. As a general-purpose technology, AI’s applications are potentially end-less. Not endless! Because technology is based on logic, so artificial intelligence, AI in the normal sense of the word cannot be endless. Unfortunately, the current trend in commercial AI development is toward more and more automation, with potentially disastrous consequences for human society. To be sure, automation has been an engine of productivity growth since the beginning of the Industrial Revolution, when, starting in the late eighteenth century, weaving and spinning were mechanized. But the tide of automation does not automatically lift all boats. It is because logic is not complete, as Marx explained by introducing the theorem of the negation. “A set of axioms is (syntactically, or negation) complete if, for any statement in the axioms’ language, that statement or its negation is provable from the axioms. This is the notion relevant for Gödel's first Incompleteness theorem. It is not to be confused with semantic completeness, which means that the set of axioms proves all the semantic tautologies of the given language. In his completeness theorem, Gödel proved that first-order logic is semantically complete. But it is not syntactically complete since there are sentences expressible in the language of first-order logic that can be neither proved nor disproved from the axioms of logic alone. However, with new technology, there was wages and employment growth since the Industrial Revolution. As automation has displaced workers in performing certain tasks, other technologies have emerged to restore labour’s central role in the production process by creating new tasks in which humans have a comparative advantage. These technologies have not only contributed to productivity growth but have also increased employment and wages, generating a more equitable distribution of resources in the process. A similar pattern of technological change, fuelled employment and wage growth for high-and low-skilled workers alike, in the decades following World War II. In the past three decades, the accompanying changes needed to offset the labour-displacement effects of automation, have been miserable. As a result, wage and employment growth have been near zero, and productivity growth suffered. AI appears set to accelerate this pattern, leading to higher inequality. Also more decades of slow wage growth and declining labour-market participation. Strangely there is nothing about AI, which requires this outcome. On the contrary, AI applications could be deployed to restructure tasks and create new activities where labour can be reinstated, ultimately generating far-reaching economic and social benefits. If that isn’t reason enough to be careful with AI-guided market, there are additional problems specific to AI technologies. Take one example. The field is watched by a handful of large tech companies with business models closely linked to automation. These firms account for the bulk of investments in AI research, and they have created a business environment in which the removal of useful humans from the production processes is regarded as a technological and business task. To top it off, political powers are helping companies through accelerated tax breaks, and interest deductions – all while taxing labour. No wonder adopting new AI has become profitable even when the technologies themselves are not particularly productive. Such failures in the market for innovation and technology seem to be promoting precisely the wrong kind of AI. A single-minded political intervention focusing on automating more and more tasks translating into high productivity and wage growth are necessary. Thus by recognizing an obvious market failure and redirecting AI development toward the creation of new productivity-enhancing tasks for people, one can achieve shared prosperity once again. No one dares to hazards, with better political vision.